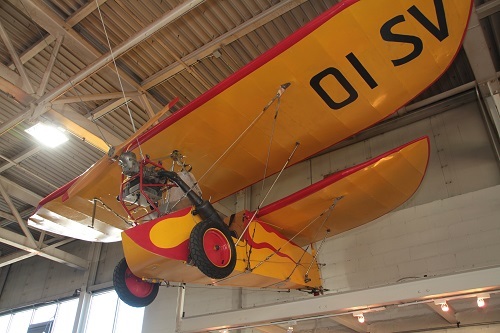 French radio engineer Henri Mignet set out in the early 1930s to design a plane that was not only easy and safe to fly, but one that could be built at home with basic skills. In November of 1934, Mignet published Le Sport de l'Air which included all the dimensions, plans, and tools needed for readers to build their own HM.14, the first of the Flying Fleas, or Pou du Ciel (literally translated as “Louse of the Sky” in French). 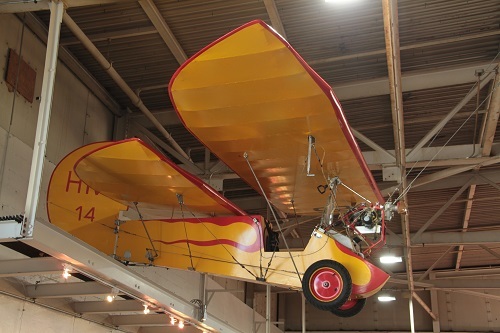 The HM.14 is best described as a highly staggered biplane, without a horizontal tail. 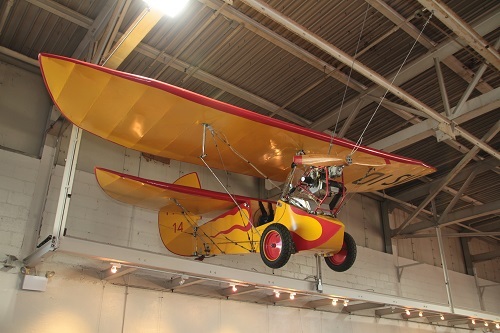 Unlike conventional aircraft, however, the HM.14 has no ailerons or elevators, and no foot-operated flight controls. Fore-and-aft movement of the stick controls the front wing’s angle of attack, increasing or decreasing the lift of the wing. 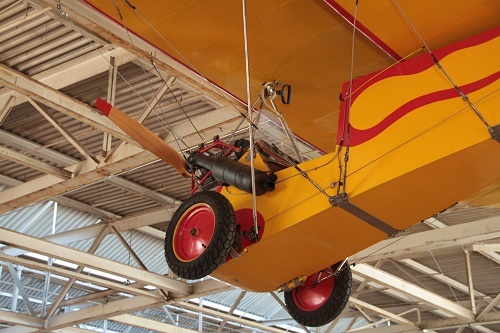 Because the front wing is located forward of the center of gravity, the aircraft’s nose will pitch up when the stick is pulled back (or down when the stick is pushed forward). The large rudder is controlled by side-to-side movement of the stick via cables. In flight, this produces a stable rolling motion, as required in a banked turn; however, this rolling characteristic is not readily available during take-off or landing, so crosswinds are not well-tolerated. Empty Weight: Design – 350 lbs. Gross Takeoff Weight: Approximately 545 lbs.